The guide, Peter, was fantastic. He was a lot of fun and very knowledgeable! Made sure everyone was felt special and genuinely cared for people. I would recommend this trip through Collette in a hear beat. All of the trip was a huge memory. I had a great trip. I loved the Colorado Rockies and would love to travel west again. Our trip coordinator, Wendy, was excellent and I would highly recommend her. The price was reasonable for the services I received. The hotels we stayed out was great and the food was good. I just loved all the sights we saw and really liked our train ride. Nice hotels, great tour guide, excellent bus driver and a great itinerary. Great trip and Collette always takes you to the best places to be seen wherever you go. Only wish Pikes Peak was included even though the cog rail was not in operation, but vans were running to the top, Always enjoy traveling with Collette. We got to see all the National Parks and had great weather and good friends with us on this trip. Yes, we would travel with Collette again. I didn't have a favorite. It was a group trip arranged for us. I didn't deal with anyone at Collette other than the tour guide who was wonderful and the bus driver who was also wonderful. We saw lots of wonderful sights, but we spent way too much time on the bus. I think it would have been better to eliminate a few stops so that we had more time when we stopped at places. Some stops were like 30 minutes. That definitely wasn't enough for Redlands. It was a nice tour. Except for the Cliff Palace, not very hands on. The 2014 we stern trip was much better. Can't attach a photo, we never received the one promised to us by our leader Kay. We also never received our c/d from the 2014 trip with Kay. Not hands on. Spent too much time in Denver. everything was just great!!!! My only thing was sometimes things were just alittle rushed, but I KNOW WE HAD TO STAY ON SCHUDULE. A few more meals would have been nice, but the meals we had were outstanding. new did feel alittle rushed with some meals. Our tour guide was outstanding!!! All the tours were great,but sometimes alittle to rushed!! Tour and guide were exceptional. Even the bus driver was above average. There were some long drives that were tough. The weather was changeable and it was hard to determine what to wear. That was no fault of the tour. I appreciated the interesting changes in weather. It was the perfect time of year to visit Colorado. The scenery was beautiful. The Rockies were an unbelievable experience. It made me proud to live in such a beautiful country. Mesa Verde was incredible. It is hard to imagine people living there so long ago. The Rocky Mountains, on first sight, are miraculous. There aren't words to describe the feelings it inspired. The tour was very well organized, and we were very pleased with our guide and bus driver. They are both professionals who know the business and aimed to please in every way. The Colorado and Utah scenery were spectacular! They took care of everything! The driver and tour director were fabulous! They were very knowledgeable and at the end I left feeling I had made friends. Trip well planned with lots to do. Excellent tour guide! Returned after regular return date to airport and transportation was provided. Sit back and enjoy the trip with Collette - no worries. Loved it all Mesa Verde, Strater Hotel. 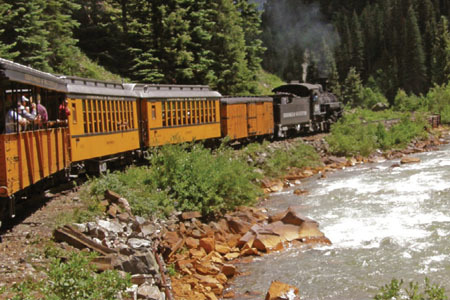 Silverton Durango train, Royal Gorge train, 16th St Mall in Denver, and all the rest! Collette takes care of their travelers. Because of flight delay, we missed our transfer in Denver to the hotel. Another transportation company was sent to pick us up. While touring, we has several rest room stops. I love the Arches National Park and the Royal Gorge Route Railroad. I rode in the open boxcar. Worth every cent. Spectacular vistas, places, etc. Manager well prepared. Hotel location good. I have traveled many times with them. The guide this time was Jan Lowe great lady. She really knew her information. The trip was a long one on the bus. Saw a lot of beautiful scenery. It was a great trip but long rides on the bus. We traveled over 1750 miles in 7 days. The scenery was beautiful. It was very interesting. Our guide Jan Lowe was great. She was so knowledgeable and made the trip fun. A very enjoyable tour of our country's beautiful landscapes! The trip was led by a wonderful tour manager, Haydee, and was well-organized, interesting and spectacular! The beautiful landscape of Colorado and the Rockies was magnificent! The two train rides were exceptional. Incredibly helpful during booking and when we had flight issues. Great group and wonderful guide! Haydee is the best. Always , politely and pleasantly , answered all questions and will ( and have) recommend traveling with Collette! Enjoyed all the unexpected/unscheduled stops to Red Rock concert arena , as well as the lunch stops in Vail, Ouray , Silverton, and Salina. The itinerary was excellent and the tour manager was the best. Loved the sights and exploring the parks. Excellent tour manager......very enjoyable trip. The tour guide was awesome and knew the area we were traveling in, the bus was comfortable, most of the hotels were good with a delicious breakfast. The only drawback was long bus rides between destinations. I would recommend Collette! They are detailed oriented and try hard to please. The tour guide and bus driver surprised us by taking us to Red Rocks! I was very impressed with the museum and the history. All the parks had something unique about them. Collette provided us with the best tour experience we have ever had and we truly enjoyed it. Our tour guide (Althea Bartlett) was a true professional and our bus driver (Calvin) was excellent. The bus was very comfortable and spacious. Althea also included stops at locations not on the itinerary and this was an added plus. We will definitely take another tour with Collette again. Colorado Rocks - Literally and Figuratively! Our guide, Curtis Evans, was top-notch. His organizational skills, preparedness and thorough love of his work and the wonders of Colorado made our trip wonderful! 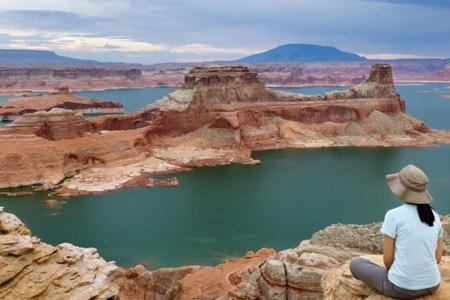 The Colorado experience brought us to 3 Natinal Parks; they were awe inspiring! The customer service department at Collette, that I had to deal with was amazing! They responded quickly and if they didn't have the information, they found it for me. The only reason I gave a 4 was because of our tour guide. 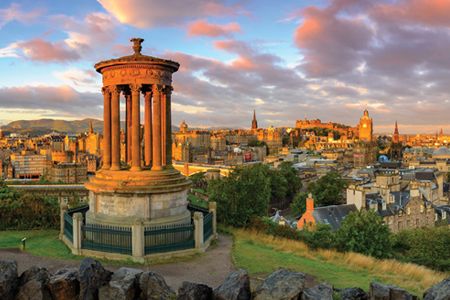 The destinations on this tour are incredible! We loved the Colorado National Monument best but that's just because we had rainy weather in RMNP! And when the Silverton Durango Railroad was derailed because of mudslides, Collette put in Great Sand Dunes National Park as a substitute which was greatly appreciated. Everything was perfect. I'd go again with Collette. Both tour guide (Alice) and driver were excellent, providing for an interesting tour and drive. In an unforeseen situation, bus breaking down, both were helpful and extremely professional in dealing with the situation and passengers. I would definitely travel again with this company and recommend Collette to others. Due to forest fires, our trip on the railroad in Durango was cancelled, but we were able to view the relatively new Gunnison National Park with its spectacular Black Canyon in its place. I liked the hotels we stayed at. The tour bus was very clean and our driver did a very good job. Our tour guide was very knowledgeable. Due to the fires in Durrango, as well as the closure of Pike's Peak, there were good substitutions for our group. Durrango. I loved the hotel and walking the town. The piano bar was fantastic. I would have preferred staying there the second evening to listen to the guitar player. Absolutely I would recommend them. It was so much fun. Each day was just so much fun. We had a good group of travelers and a great guide and everyone got along and made friends. the national parks were amazing. we have traveled with Collette on more than 10 trips; always a great tour manager and the trip is well paced. Very safe, fun, educational way to travel. Tour manager and bus driver were always at our service and with our best interests at heart. Always a great experience with Collette!!! Your guide was average at best. Your guide talked too much. Some days were too long. very enjoyable time in the Colorado Rockies. Beautiful fall scenery. Great variety of things to see and do, except for the unplanned blizzard in the Rockies! Our bus driver(*****) was TOPS. Photo ops were much appreciated along the way, and very nice selection of hotels. I personally like multiple nights in same hotel when appropriate. Love to see the national parks. Great tour with lots to see of the national parks. Great weather too. Beautiful scenery travelled 1,500 miles. Yes you can do better. I have been on many Collette trips and am noticing a declne in several areas. The food is below par in many of the places and there certainly has been a drop in the numbe of meals served. And some of the hotels have "lost their shine" and not up to the standards I have grown to expect. Maybe it's time your people STAY in them and check them out rather than just automatically renew contracts with them. Tour itinerary was good. Scenery speaks for itself. Hello, thank you for sharing this feedback with us about the food and hotel quality on tour. We have passed this along to members of our team for review. We appreciate you and value your insight as it helps us to improve our tours for future guests. We look forward to traveling with you again soon. Choice of sites, hotels, and meals were wonderful; favorite dinner the winery and favorite site mesa verde; hotel in durango fun although the room/bathroom small we didn't mind as it is such a charming unique experience! The coach driver left a lot to be desired as he would not carry water, reach out to assist when disembarking and rarely spoke with us. Stops at the national parks were too few and short. Much too much time spent in bus. Winery trip was fun and dinner was delicious! Durango cowboy dinner and show was lots of fun! Tour Manager, *personal details removed by Feefo* was engaging with her music ability! Bus was comfortable but bus driver needs improvement with his personality and driving skills. Nice and friendly people on the bus tour. Perhaps you could add Great Sands National Park to itinerary..... as it seemed like we took a longer way around to get to Colorado Springs. Our tour manager, Heather Larson, made the trip very special. I would and have recommended Collette's services to others. Included activities were well thought out, although the first day's travel by bus was really long. Great! Tour Guide and Coach Driver were both excellent. See comments on previous page. Had a great time Both tour guide and coach driver were excellent. Definitely will recommend and as for us, we already have another tour (our 8th I believe) booked. Always enjoy traveling with Collette. Tour guide, *Personal details removed by Feefo* went above and beyond to accommodate every person one the tour. There was so much to see and enjoy. I loved the clog rail up to the top of Pike's Peak. Views were breathtaking! Short amount of time at destinations and long travel time to get to them. Maybe less destination, travel time and more time at cities and parks. I would recommend . Bus ride to long on one day. Became boring. A lot of money for a bus ride only. Other tours group provide more meals than Collette. On your own became to catch phrase. Photo oops for animals was almost zero. Handling of tips was less than professional. Cash at the end may have reduced amount of tips due to using at other times. Outside of these issues the tour was fine and I would recommend. Dinner at vineyards. Very good and a fun time as well as educational. What we saw was exactly what we wanted to see. The way we saw it was not. We spent WAY too much time on the bus. Days started early and ended late. Due to altitudes, we were constantly told to drink lots of water, yet they charged us $1 per bottle. All other tours i've been on the water was free. There were plenty of "comfort" stops and the tour guide was great. I think this tour should be two 7 day tours instead of one 9 day tour. The parks were all great! Yes, I would recommend Collette and definitely would buy another tour from the company. The bus driver and tour director always worked cooperatively together to help the client in any way he or she might need help. I am handicapped and used a rollator to walk long distances or over rough terrain. I had traveling with me two teenage granddaughters. The bus driver always maintained a calm mannerism and was always helpful. The tour director showed me special consideration regarding my mobility. On the bus she also educated us about the various sites before we visited them which made things more interesting. I especially enjoyed the Arches and Canyons National Parks as well as the Mesa Verde National Park. I enjoyed visiting the National Parks in Colorado & Utah. Colette was fabulous - great, great attention to details and an outstanding tour program and guide. The tour guide Heather was curteious and caring. She tried to accommodate everyone's needs. Also the bus driver Rich. The tour was all I could have asked for. The narrow gauge railroad from Siverton to Durango was fantastic. As was the cog railroad up Pikes peak. Another great opportunity to see our National Parks. Collette encourages an extra day at the beginning of the tour. We decided to do this, but we had to make our own arrangements to get to the hotel. Our ride home from the airport was given by the same company that we have had on our past trips. This time the car was too small. My husband hit his head and I had a problem getting in the back seat. Our tour manger was very good. She was from this area and shared a lot of personal info about the location. Our driver was excellent. The extra tour guides were very informative. This was our 5th Collette Tour. Everything on the itinerary was covered. It was a lot of traveling time on the bus, especially when we lost 45 minutes due to a wrong turn. I wish we could have made a stop at the Four Corners Monument. I also expected to go into the dwellings at Mesa Verde rather than just to view it from the other side as a photo opportunity. Would have preferred a different hotel than the Strater. Got tired of scrambled eggs every day. Hotels needed to provide more variety. Besides the wonderful National Parks and Dead Horse (a spectacular addition) and the Island in the Sky, my husband and I enjoyed the Vineyard, Chuckwagon entertainment (dinner was fair) and the two train rides! Looking forward to another Collette Tour next year. Guide was excellent, knowledgeable and enthusiastic. I would recommend Collette to friends. Scenery was beautiful in national parks - Rocky Mou tain and Arches were our favorites. Downtown Grand Junction was beautiful and shopping was good . We were able to ship from there. People on the tour were a fun group. People were open and friendly. The itinerary was exactly what we wanted and our tour manager was outstanding. It was exactly the itinerary was wanted. All around good and enjoyable tour. The courtesy and efficiency made the trip very enjoyable. The selected parks were beautiful. The Rocky Mountain tour was my favorite. Day one arrived at hotel 1:15 got a room after 5:00 not happy.Felt rushed every stop.Lunch to me is12:30 /1:30 not after 3:00.Mesa Verda not up close seen from other side of ravine very disappointed.The lout for 5#ast night got back 5:00 had to be out at 5:30 for final dinner. The guide was fantastic, the accommodations and meals were excellent. I have already written my inside rep Matt Voccollo . We enjoyed the trip very much. The tour guide was excellent and the driver was as well. There was a problem checking in at the Denver hotel. Excellent tour manager and bus driver. The local guides add so much to the tour. It was also nice that we didn't have to pack and go to a new hotel every day. Most memorable experience was going to Pikes Peak. The Arches was a great disappointment . The time could be spent elsewhere, perhaps the air force academy. Drop Strater Hotel; include tips for guide and driver; more free time. First, too many surveys. We did one, on paper, at the end of the tour. This is bordering on "bothersome". And, by the way, I will collaborate my answers with my spouse, so she will not be replying - HER WISHES. THE TOUR WAS FINE; Answers to specific questions will appear on paper survey issued at time of departure. Yes. Please re-read the paper survey we did at the conclusion of the tour. See opinions above. Strater Hotel is old and dark, without enough room to change one's mind. Drop it from the itinerary. Nice history-poor hotel. More free time to walk around towns visited needed; Sitting gets old. Bus riding is excessive, but understandably. Tour Manager, though excellent, needs to be able to speak crystal clear English to a bus load of 44 people in their 60's to 80's. Price a bit too high, in our opinion. That's it. Very nice trip,excellent driver, tour director not quite as good as previous experience, Hotels perfect, food very good The itinerary was a bit lengthy, but saw so much , it was well worth it. Your trips are very good. We have taken 5 trips with Collette and have enjoyed all of them. We had never been tp Colorado and the country side was beautiful. I like the service that is provided. The reps. are always willing to help. I would recommend Collette to my friends. This was our 5th trip with Collette. The rafting trip was great. The mountains were beautiful. I have vacationed with Collette many times. This was the first time I had an issue with a trip. Basically, there was too much bus time and the days were too long. Perhaps they could have eliminated a stop to make the days easier on the bus full of older people. Also the Durango Strater Hotel was a dump. I saw so many beautiful places tht it is hard to pick one memory. We had a very enjoyable tour. Our manager was great as was the driver, The other members were about the same age as to make a good group. Probably one of our best trips. We saw things we probably would not have seen on our own. Not sure where to go next, but we will be looking to Collette. Of the various forms of travel, bus tours are at the bottom of my list. That being said, this was one of the better bus tours that I have been on. The trip manager and bus driver, did an excellent job of balancing and responding to everyone's needs and preferences. The coach was well equipped and very well maintained. It was, by far, one of the best tours we have been on with Collette. The tour manager, bus driver and step on guides were very well informed. I will (and do) recommend Collette 98 percent of the time. Every day was a wonderful visual and mental experience. It would be very hard for me to pick out and one particular day since they were all very memorable. The tour was excellent and our tour guide was outstanding. I would have preferred less bus time and more walking time even if it meant extending the trip by a couple of days. Hotels were just ok for the price we paid. Great experience with booking the trip. I contacted collette about a trip to the Colorado Rockies. All the service personnel that I spoke to were most helpful. The experience making arrangements was great. My husband and I enjoyed the trip. Guide was very knowledgeable, personable and engaged with passengers. Each days views were stand alone events. Great trip!! Collette tours are the best. This is our 2nd trip with Collette Tours. 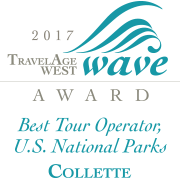 We hope to do more with Collette tours in the future. Our tour guide and driver were very educated and we learned a lot about the area's we saw. Arches National Park one of our favorite places. As always, Collette came through again with a very enjoyable experience. They took good care of us the whole way from home and back again. The motor coach guide and driver were reliable ,fun, and kept us safe and entertained. I saw so many wonderful places that I've always wanted to see. Arches Nat. Park, Canyon lands, Cliff house dwellings, Pikes Peak and met a lot of friendly and fun people. Thank you for a wonderful vacation. It was so nice to have everything planed and set up for us. I know if we were vacationing on our own, we would never enjoyed as much of Colorado. Enjoyed all of the landscape features...... From the twin arches to the Garden of Gods, just beautiful. Everything was great. Rooms, food, and service. Pikes Peak you have to see it to appreciate it. I would recommend the company. There were places I would have liked to have spent more time. It seemed that time was abundant at gift shops and for eating, rather than at the parks and monuments. Example: Mesa Verde -- We could have spent more time at the overlook and for the movie, but I felt we we rushed, so we picked 1 or the other. We got back to the gift shop and lunch and everyone did what they had to do and were sitting outside waiting on the bus to continue the tour. Little more time in the park and less time at the gift shop would have served us better. Few places the tour guide and park ranger was confusing as to what was going on. Other than that everything was good. 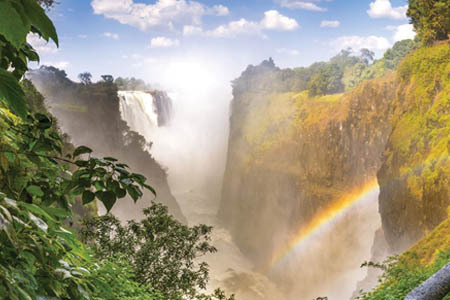 The service on this tour and other Collette tours we have been on have always given excellent service. Leave on time and return on time. The scenery in the parks were stunning. Everywhere we went was more beautiful than the last place. Food was good when it was included. The days were extremely long to get to see everything. Think we should have stayed closer to some parks so the day would be shorter. Also, when we went to the Arches park, the guide and tour director were not clear on beng able to go on a walking tour with the guide. Gave us a chance to go alone up to the large Arch which was fine, but when we got back the guide had taken another group up to the cathedral area, which some of us wanted to see, and said there was no time for us to go up on our own and had to leave. I specifically asked if the guide was going to take us there when we got back from seeing the Arch and both the guide and tour director said yes. Disappointed we didn't get to walk there. Thought the guide was average. We had gone to parks that we were waiting to leave on the bus because we had seen everything and yet there were other times we felt we didn't have enough time in places. Need to organize tour better. We felt the tour director was ok. Very pleasant, good sense of humor, knowledgeable. Not as organized as we are used to with Collette. Loved the scenery. Fabulous guide when we were at Mesa Verde. Loved Mesa Verde, could have seen more there. Loved the Cog train ride up to the top. Worth every penny. Loved the cowboy ranch and show. So much fun. Problem was that we were there 3 hours early. Did not need that much time there before the dinner and show. Every park was fantastic. The Garden of the Gods was amazing. The film we watched was wonderful. Wished we could have seen the museum. Nice train ride from Silverton to Durango, long, but nothing you could do about that. Loved Durango. Great bus driver. Very pleasant, efficient, would do whatever he could to make your trip good. Always enjoy traveling with Collette. Will use again, just felt time management was not good on this trip and tour director could have been more organized. The catalog does not indicate which dates are guaranteed to go. 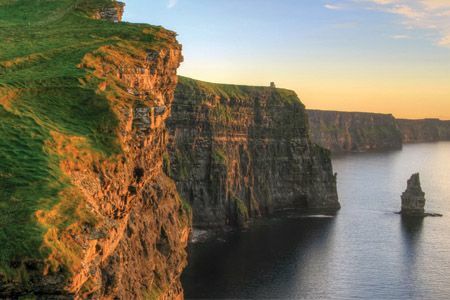 This tour covers a remarkable number of unforgettable sites in a few days, with great accommodations and experiences. Very Happy with home office. Talking to your people at the home office is always a pleasure. Always helpful and convey that they love their jobs. Great group of fellow passengers. The sites were second to none. I believe the tour should end in Denver instead of Colorado Springs. Also should go to the Air Force Academy. Best hotel was in Denver. The guide and bus driver were excellent and addressed all issues and made the tour fun. The weather was much hotter than normal and they insured we drank sufficient water. We'd definitely recommend Collette to friends. I loved Arches National Park and Varaison Winery the best on this tour. It was awfully hot to enjoy Arches, but the park is incredible. Also enjoyed the lunch in Moab, what a cute town! The one thing that I was taken aback by was the large granite 10 Commandments plaque next to the front door of the last hotel in Colorado Springs. I realize that is their prerogative as a private business, but it seemed somewhat insensitive to diversity. Not everyone is a Christian or Jew, and it just isn't necessary in a business setting. Wait times on the phone are way too long in order to just ask a simple question. 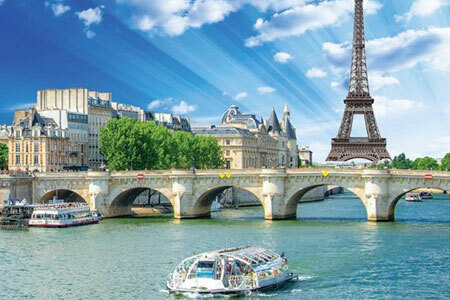 The cost compared to other similar quality tours we have taken was higher. Because so much emphasis was placed on finding high quality lodging, time was sacrificed which could have been spent seeing more of the sites. For example, by staying in Grand Junction and then driving 7-8 hours round trip to The Arches and Canyonlands, we only were able to stop at 1 location in The Arches in 1 corner of the park for a little over a half hour, half of that time was spent waiting in line for the 1 functional bathroom. This did not allow enough time to even walk up to one of the arches, having to turn back halfway in order to get back to the bus on time. If it would have been possible to spent the night in Moab in a lesser hotel, more time could have been spent driving through the Arches (instead of just seeing 1 corner or the park) and maybe seeing some of the dinosaur sites we saw along the road. There are several thousands of arches, and we saw only a few of them. Mesa Verde was fantastic. I wish we could have gotten closer to some of the larger ruins like the Cliff Palace instead of only viewing them at a distance from the drive along the overlook, but understand it may have been hard for many of the elderly to do the walking tour of the larger dwellings. Overall it was a good tour and we saw some beautiful sites and met wonderful people. The tour itinerary was excellent. The tour guide and bus driver were professional, courteous and personable. The hotels were delightful and generally well-located for our convenience. The trip to Pike's Peak was certainly a highlight, something I have wanted to see for some time. Even the trip on the cog railroad was an adventure. The tour was not well planned or organized. Lack of prior planning on stops, on routes, and places to eat. Wine tasting was awful! Skip it! "Scenic route" between Durango and Colorado Springs was a waste of time. Too much time spent on the road and not at places of interest. Have nothing really good to say about stops or trip. Please accept our sincere apology for the conditions you experienced on tour. We have forwarded your feedback regarding the timing of the sightseeing to our Product Development Team. They will be reviewing this feedback and using it to enhance this tour for our future guests. Thank you for bringing this to our attention. If you would like us to set up a time to chat with our customer care team to hear more about your experience, please let us know. The tour was wonderful! Everything was so well Karen, our tour manager was so nice and cheerful. This was our first Collette Tour and we look forward to traveling with them again. The Doubletree Hotel in Grand Junction was an excellent choice-- the food in the restaurant was really good -- every staff person that we met was so friendly and anxious to please us. The winery tour and dinner were also an excellent choice. Problems with the airport pickup at both Denver and return to Boston. At Denver our flight landed 15 minutes ahead of schedule but by the time we got our luggage it was past our scheduled arrival time, so the limo should have been there. It was not. As in our instruction booklet, we called the limo pickup after retrieving our luggage. They said we were early and it would be 30 minutes before they would be there. The 30 minutes came and went and no limo. So we called again. Told the limo would be there in 10 minutes. It was not. It took another phone call and another 10 minutes before the limo arrived. The limo driver said had no record of our needing their service. On our return to Boston, we again called the limo service (800 number) after getting out luggage but no one answered the phone. We tried the local number only to have a recording that it was no longer in service. While my wife tried calling again, I went outside and found the limo driver waiting. Needless to say, I think if I ever do another Collette trip, I'll arrange for my own limo service. Also the flights that Collette picked were horrible. We missed the welcome dinner as we did not get to the Denver hotel until 10:30 PM. Collette did give us back $80 but that was not the point. If the welcome dinner is part of the package then all flights that Collette picked should have gotten us there in time for the dinner. On the return to Boston, we only had 58 minutes between flights. Luckily our first flight was early so we made the connection. After we were told about our flights (a few weeks before the trip) I saw I could get non-stops both ways for slightly (under $200) more but Collette would not allow us to cancel the flights and refund us that money and allow us to book the non-stops on our own. The non-stop to Denver arrived inn the afternoon, so we could have done the welcome dinner. In the future I'll make my own flights, no matter how cheap the Collette ones are. Otherwise we really enjoyed the vacation. It was a wonderful trip! Though, could have used a couple of free afternoons. The tour guide and driver were top notch!! Take in the majesty of the Colorado Rockies and celebrate the freedom loving spirit of the Old West. When reserving a triple room, please note it will have two double beds. Due to fire safety regulations, a rollaway bed cannot be brought into the room. Due to tour scheduling, flights on the last day of your tour should not be booked prior to 10:00 a.m.
Our air passengers will depart from Denver, Colorado. All transfers will depart Colorado Springs for Denver. This tour includes travelling to high altitudes (approx. 14,110 ft.) and may not be suitable for some clients. We suggest that you consult your doctor if you have any concerns. *The "Old West adventure" will not be available for tours arriving into Durango prior to May 27, 2019 or after September 5, 2019. On those occasions, your meal will take place at your hotel or a local restaurant.